Interviews are online for your viewing and listening pleasure! Would you like to know more about how the ONE Good Deed Fund came to be and the vision for future? Board president Laura Hale had two opportunities in the last month to discuss just those very things. If you’d like to support the fund’s upcoming grant rounds, please consider making a gift. helping with house painting for a person who has lived in the same house in the Old North End for 65 years and makes her living helping others. We are thrilled to be part of this excellent work! Our next grant round will end Friday, December 11th, and if you’d like to apply, you can do so through our online form or download a paper copy. We were so thrilled to work with Burlington Children’s Space preschool teacher Charles Winkleman on a grant to help his class help others. We provided 12 sets of tiny gloves and a wagon so that his students could pick up trash while they take walks in the Old North end by their school. Their “Helping Heroes” program is a perfect way to inspire the next generation to be part of their community! 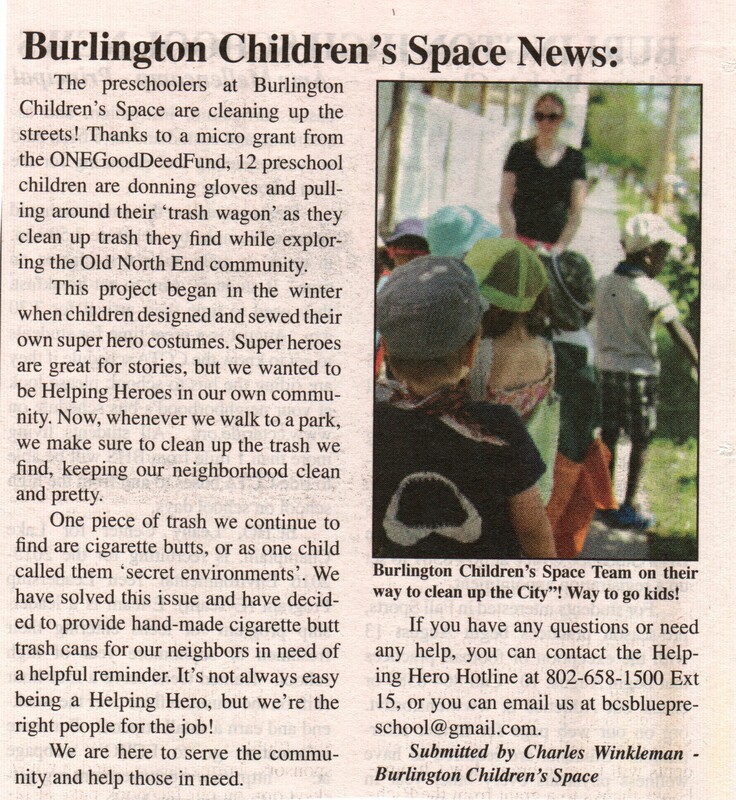 More information on this program is available on the KidsVT blog and in this article from the North Avenue News. Great work, friends! In our spring grant round, we were pleased to award the cost of building a custom bike for a woman who uses her bike every day to commute and it was in desperate need of replacement. Christine applied for funding, we approved it, Dan at Bike Recycle Vermont built it, and yesterday, Kathy got her new bike! We are thrilled to have played a part in making Kathy’s daily commute safer and easier. You can see a video of Kathy getting her bike on Bike Recycle’s facebook page and read more about the bike they built on their blog! The letter came in the mail today and we are pleased to announce that after months of work, we have been granted official 501(c)3 nonprofit status from the IRS! That means that all donations are now tax-deductible on both federal and state tax returns! The spring grant round is closed and we are happy to announce that we are funding 2 grants, and working with 2 other applicants to see if we can make their ideas work with our guidelines! We’ll be awarding the cost of a commuter bike for a woman who uses her bike for most of her transportation needs and has an unreliable one now, and we’ll be funding a game set for a community member who welcomes many people who are new to the neighborhood into his home and connects them to others. Congrats to everyone and thanks for such great applications! ONE Spring Fling was a Success! Thank you to everyone who celebrated the Old North End and the ONE Good Deed Fund’s first anniversary at the ONE Spring Fling on Saturday! It was a great success and we raised enough to cover 5 more grants. Thank you to everyone who took a good deed from the good deed tree and are out in the community doing those good deeds, and to everyone who decorated a post card that has been sent out to random addresses throughout the Old North End. We had 60 post cards total, which gave us enough to send one to an address on every street in the Old North End. Photos from the event are up on our facebook page. Green Belt Gardens are Coming this Spring! This spring 2015 grant round we are pleased to offer up to 5 green belt garden installations! Green belts are the strip of land between the sidewalk and the street, and they can often be neglected. If you know someone who would love a green belt garden and either owns their property or can get permission from their landlord to have one installed, the ONE Good Deed Fund will provide the plants and the volunteer labor to install the gardens! You can apply using the same application we use for all of our grants and specify that you are requesting a green belt garden. The spring grant round deadline is May 15th, and we hope to hear from you! The ONE Good Deed Fund has been working with ONE Arts, Whirled Tree Arts, and CVOEO’s Fair Housing Project for months to organize “HeART and Home: Celebrating Inclusive Neighborhoods for Fair Housing Month”. There will be 9 ongoing exhibits and 3 special events – including our ONE Spring Fling event on 4/18 – that will be happening in Burlington and Winooski throughout the month of April! Check them out: http://www.cvoeo.org/fileLibrary/file_162.pdf and follow along on facebook. One resolution can change your life and your community. Resolve to do good deeds. Nine months ago I founded the ONE Good Deed Fund to cover the costs of doing good deeds in my neighborhood, Burlington’s Old North End (O.N.E.). Like many places, the O.N.E. is full of wonderful people who want to help but can’t afford to, don’t know what to do, or are dealing with significant struggles of their own. With a high percentage of people piecing together a living working multiple jobs, and constant turnover of residents in rentals, it can be tough to bring people together. So the ONE Good Deed Fund was born to overcome those issues. The fund was designed to be easy to access and to prompt people to think about what they can do for someone else. All that’s required is a short application and we award up to $100 depending on the materials and services needed for the good deed. So far we’ve granted out the cost of a truck to haul away debris from a shed that was burned down in an act of arson, exercise equipment for a person whose insurance stopped covering physical therapy, a child care bill for a parent who lost their subsidy during a job change, and waterproof boots for a grandparent who has given everything she has to raising her grandchildren. Our goal is simple: to help build relationships between neighbors by encouraging good deeds. My inspiration was a neighbor of mine. S.J. had not had an easy life. She had been homeless, she had lost her husband and son to illness, and she had battled cancer four times. She shared her small apartment with several relatives and it was a tense situation on the best of days. And yet she was the kindest person you’d ever want to meet. She knew everyone. She smiled brightly. She gave gifts of wind chimes from her prized collection. She always thanked me for listening to her. When her dog passed away, she and I created a headstone to remember him and put it in the garden. Her smile and her kindness to others are what made our neighborhood special. One night, a few years ago, my partner and I saw an ambulance pull into the driveway and we knew the second we saw it that she was gone. We cried. She passed away peacefully in her sleep and left a huge void behind. Not a day goes by that I don’t think of S.J. and am inspired to make someone else’s day a little brighter in her honor. Bad events stick with us humans far more than good ones. There’s a large body of research showing that the psychological and physiological impact of negative experiences outweigh those of positive experiences. But we can combat that by increasing the good. In his 2001 The Review of General Psychology article “Bad Is Stronger Than Good,” Roy Baumeister writes that it takes five good events to outweigh one bad event. It’s on all of us to be the source of those good events. And there are a lot of benefits to being part of the good. According to author David R. Hamilton, being kind can make you happier, improve your cardiovascular function, slow aging, improve your relationships, and spread to those around you. In short, kindness makes everything better. So please, be kind. Spread it like the air we all need to breathe. Smile at strangers. Listen to someone else instead of just waiting for your turn to talk. Open a door for someone whose hands are full. Genuinely thank people. Before you speak, ask yourself if what you’re about to say is necessary, helpful, and kind. Give meaningful things away. Be one of the 5 good experiences someone will need to overwhelm the impact of a bad one. Shine your light out there in the dark world. Look at your community for what it is – a collection of people who are capable of good deeds and great kindness – and join in.